Before I begin sharing my pampering session, allow me to point out that beauty starts from inside out. I know, I know, you have probably heard this quote a gazillion times, but the truth of the matter is that though you know about this, many of you still take it way too lightly of it and sometimes even brushing it off with the wind. Yes, drinking enough water a day keeps everything else at bay, but with the current level of danger in our environment, trust me, drinking water and absorbing 'enough' nutrients from your food intake isn't going to make the cut. "Ughhh, my skin is so dry!" "Gosh, my hair is dying, just look at the split ends!" "Am I not eating enough vegetables and fruits? Why are my nails always so brittle?!" Like I said, drinking 8 glasses of water a day and making sure that your food intake is balance, isn't going to make the cut; at least not in this era where food and water sources are polluted with chemicals. What you need is actually a boost; and that boost comes in the form of food supplements. I also know that in the current market there are plenty of food supplements that can be purchased, both online and in physical stores. Trust me, before this, I didn't even bothered to try any food supplements. Let alone trying to drink 8 glasses of water and having a balance meal. Yeap! that's me and I know some of you also face the same situation. Guilty as hell. I am definitely new to food supplements and I don't know which are the best, but recently, I have tried Nature's Bounty Hair, Skin and Nails Gummies and I can safely say that I am not against it. I know that most food supplements comes in tablet form, so I was a bit relieved that this supplement came in our childhood chewy 'gummies' form. It actually also tastes and smells very much like a regular gummy bear; sweet and a little sour-ish berries. It comes in a palm-length sized bottle, which I must say that I find it a waste of space, since there's only 60 gummies in it. A smaller bottle would probably do more good; as it will also be conveniently portable. But I guess, you could just transfer all the gummies into a smaller bottle. 60 gummies last for a whole month, as it is advised for adults to take 2 gummies per day, preferably after a meal. Of course, you can lengthen out the consumption by taking only 1 gummy per day, but I'm sure the effects will also show itself much later. If you must know, these gummies contain collagen, biotin, vitamin C and E, zinc, selenium, and it's free from gluten, artificial colouring and flavouring. 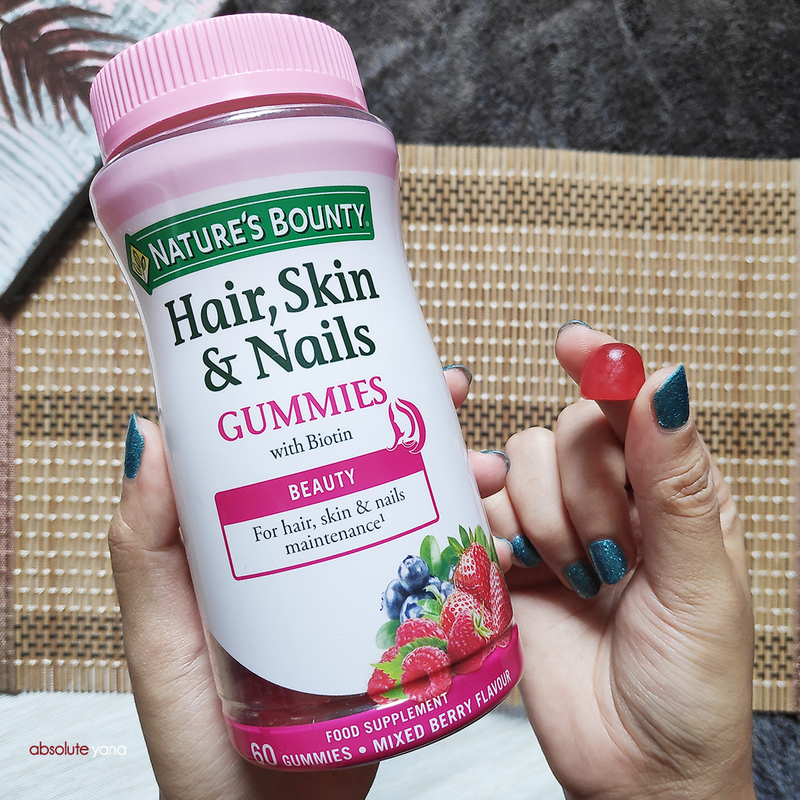 Right now, you can find the Nature's Bounty Hair, Skin and Nails Gummies exclusively at Watsons. My advise, if you'd like to try it, grab it now as they are promoting the product with an introductory price of RM68; original price RM89.90. So....once you have gotten your 'insides' all sorted out, it's finally time to pamper and care for your beauty from the outside. And I did just that, last week. It has been a long overdue pampering session, that my body, particularly my feet, needed. Ask yourself, how long has it been since you last scrubbed off the layers of dead skin beneath your feet? For me, that answer was 1 year and 7 months. Yes, it's shocking and even more so when I saw this! I am definitely embarrassed about my lack of "hygiene" and "self care", it's something that I have been trying to work on. Hopefully, no no...I'd must do a better job at it this year! 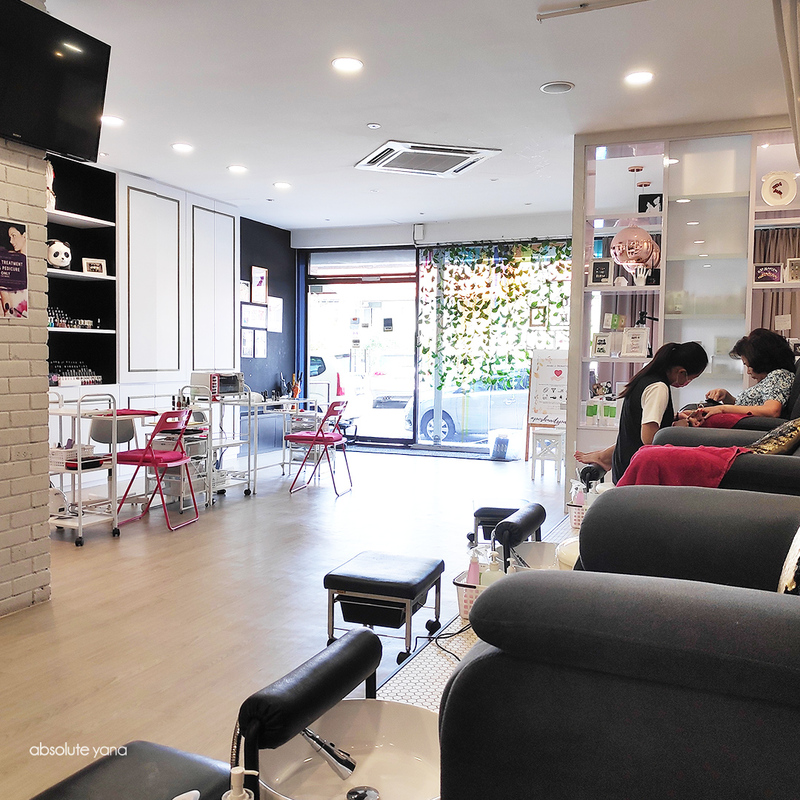 So, last week, I got the chance to quickly stop by SS2 for a foot pampering session at Posh Nails Spa, right after work. Believe me when I say, my piled up stress was lifted out from my feet by the end of the day. 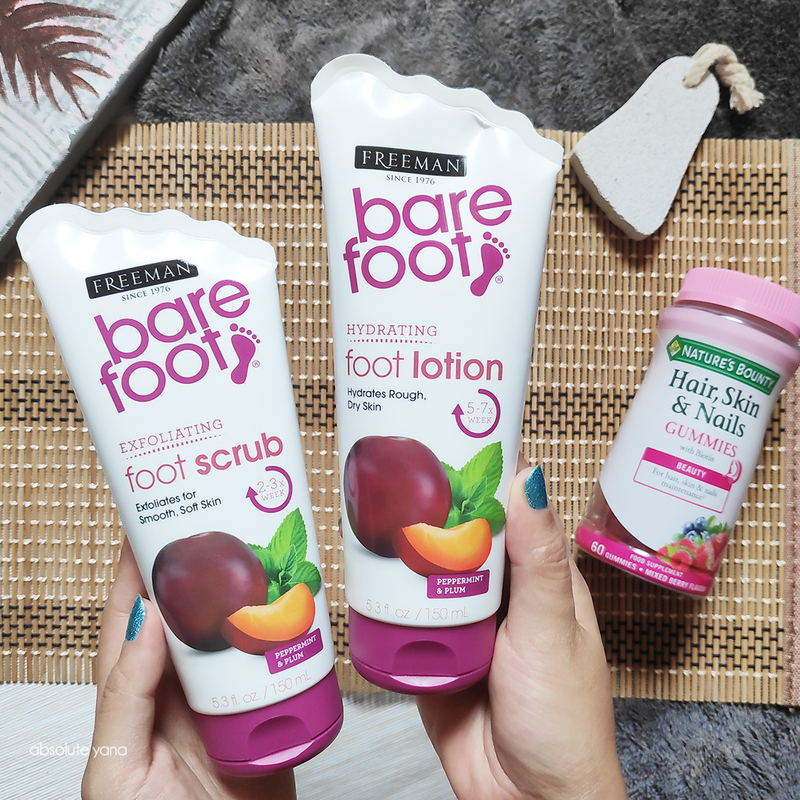 Apparently, POSH had a collaboration with the brand Freeman Barefoot, which their products are now also available at Watsons. And I was lucky enough to get a foot spa with their products before getting my pedicure and manicure done. Good enough, that the short leg and foot massage relaxed myself and unscrambled my thoughts, the scent from the scrub and lotion also helped to calm my nerves. Now, at home, I have the Freeman Barefoot Exfoliating Foot Scrub and the Hydrating Foot Lotion. Since, it only has been a week, I have used the foot scrub once, since I got it, and 3 times for a week for the foot lotion. Legs and feet have never felt so absolutely fine. You know that feeling after you have shaved your leg hair? Yes, this lotion makes you feel like you should be caressing your legs, all the time. If you can't afford a 45-minutes pampering session for yourself, then it will probably do you good to purchase a few of Freeman Barefoot products. From what I saw, there's the foot scrub, foot lotion, foot balm, cracked heel foot treatment, overnight foot cream, foot butter, and a foot cream. Just because home spa and self care session is equally as important as treating yourself to a good pampering time outside. The product series of Freeman Barefoot price ranges from RM22.90 to RM26.90. And yes of course, you can get them both online and from your nearest Watsons outlet. Whenever you have the time, or if you just would like to browse through more of the products that I have mentioned above, feel free to check their Freeman Beauty Instagram and Nature's Bounty Instagram. As a final say, please do give yourself a chance to love yourself. You deserve it. Interesting scrub and lotion to pamper ourselves. I want to try this out too to make my skin feel good. I am looking out for this kind of treatment. I can go and try soon. Freeman product I tried before. They are good! Sebenarnya setiap inci tubuh kita memerlukan supplement kan.
Kaki pun perlu dijaga, dibelai manja. Kerana kaki banyak bekerja dalam seharian..
Bestnyaaa. Gummies tu nampak macam sedap je. Haha lepas ni boleh cantik kuku kaki and tangan. Teringin sebenarnya nak pergi spa menicure pedicure ni. Nanti nak try cari la kat kuantan. Guess that is why I am always grateful to be a man as women and ladies seem to be quite..."high maintenance" LOL :D Just kidding. Ops! That's true that we got to take good care of our foot cleanliness and hygiene as well. Will definitely check out the Freeman Bare Foot products. Thanks for the info. Wah bestnya dapat manjakan diri. Tengok produk ni macam mrnarik. Besar juga pakaging dia kan?